Guaranteed to improve your website or your money back. CSS HTML Validator will save you time and help you eliminate many website problems that cause visitors to abandon your website. CSS HTML Validator also protects your privacy because it doesn't send your HTML and CSS documents over the Internet. This also means that no Internet access is required. Unlike other HTML validation software, CSS HTML Validator features an unusually powerful custom syntax checking engine that is specifically designed to check HTML, XHTML, CSS, SEO, and more. 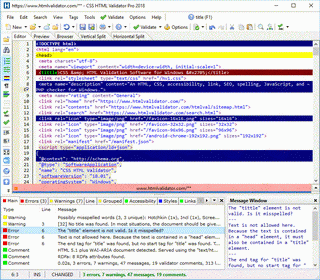 CSS HTML Validator is for web professionals, webmasters, corporations, government agencies, individuals, teachers, students, non-profit organizations, or anyone with a website. It's guaranteed to improve your website or your money back. Fantastic program! I've tried all validators and this is by far the best. The interface is perfect and it's really easy to use. It amazes me how quickly your batch validate works. I put all 219 pages of my main website through it yesterday and it zoomed through. Incredible. I've been using your software for years and have found it to be one of the better ones out there and your support for the software is unbelievable.